EITHER path is better than not doing the work. I myself would take another bath. Thank you so much for getting back to me so swiftly. I shall take another bath tonight for good measure as there's no harm in doing so. This should bring me back on track to proceed with cleaning the house down. Tomorrow. Thank you aura! I think this will be helpful with some personal issues I've been wanting to deal with as well. I've been practicing one form or another of magic for almost half of my life now. During this time, I have always cleansed my house the same way, not only when I felt something needed attention, but also as part of a routine. The work is simple, I clean the house "normally", sweeping, vacuuming, mopping, etc., followed by a sage smudge, back to front, a dill and salt powder in the corners, with a splash of Holy Water and Florida Water in each room to "seal" it up. After a few months of problems in my relationship and home life, I felt that my house needed special attention and so yesterday, 05/27, I set about to start a "full" cleansing. Within minutes of beginning my work, I found my ball python dying. When I say minutes, I started cleaning at around 7:15 and found her at about 7:30. While she was older, the way that she died, and in fact the very death itself was stunning, and to me, felt like maybe a sign. She fell on her back, writhing, gasping, and was dead within thirty minutes. Let me side track one further second and add I was a reptile certified care taker at Petco and this was the first time I have EVER seen a snake, or any animal really, die that way and that fast, with absolutely no warning signs. After dealing with the upset of her death, I went back and started the cleansing fresh, now feeling even more strongly that my home needed it. Today, 05/28, that feeling of "not right" has become a blatant, screaming, couldn't be more obvious if it was a person, for sure not right. My husband was suspended from his job for a week for not paying his boss for a messed up order. As he's a delivery driver right now, not only do we lose hourly money, but any tips he might have made as well. The car payment we'd made was returned to the bank, we're not sure why, and so his car payment has now bounced, leaving us to sort it out or risk losing the car. My landlord filed the beginnings of eviction on us, with no warning. The notice was served today, our case is on 06/02, and so we have less than a week to figure out what to do. My apartment door has come off the hinges and refuses to stay on, I will have to have it repaired or replaced completely. While it seems trivial, I'm in an extremely bad area and that door will do nothing to protect me if someone were to try and break in. All in all, this is not something I've ever experienced while doing a cleansing. Could it really just be a coincidence, or am I looking at something that a plain cleansing couldn't help with? I'm concerned and completely stumped enough that if I had the money, I'd be getting a reading done right now. Just seeing someone say "yeah, I think something's up" or "no, it's a coincidence", would help a lot. Doozie of a first post, but here ya go! Wow. I am so very very sorry about your pet snake. Poor baby. And I am so very sorry about all of your bad luck. I don't believe in coincidences. Something is up. I follow this up with other cleansing rituals. I am wondering if something in your house is toxic? Maybe that's what killed your pet. Or, it could be a negative influence there. I live in a college dormitory with one other roommate who has a ton of posters and things on the walls around her bed. She already disapproves of my involvement in Hoodoo so asking her to take them down is not an option. Is it okay if I just wash the walls on my side of the room and anoint my area with the proper oils since I rarely ever delve into her space? Do I dispose of the entire bucket at the crossroads or can i take just a small portion of the water? Also we have brooms from 2 previous apartments that I cant get rid of because of my roomate. Theyre from my very first year of college when i had 3 problem roommates and im sure theyre carrying a ton of negativity. Can I soak them in the Chinese Wash to cleanse them? Im also doing a cleansing bath, what do i do with the herbs after they have been steeped? Do i scatter those at the crossroads as well? I actually already have a shopping adventure planned for this coming weekend, and I had already been planning to buy some Chinese wash, as well as some other different items I've found out about in the Black Folder, Hoodoo Herb and Root Magic, and here on the forum. I had been considering an Uncrossing of some sort, so I think that'll definitely be on the list. As for the toxicity question, that was my first thought. I won't say it's entirely impossible, I do live in an apartment in a row-home setting, but I have other pets and no one else even has a sniffle. I will be looking into a reading probably this coming week, as I'm sad to say things haven't improved much here and I'm not sure how much bad luck we can take before we "give up" so to speak. For her side of the room, consider smoking the area in an appropriate incense of some kind. Ultimately though, do as much of the work as you reasonably can given your circumstances. It may not be ideal, but some is better than none. For water disposal, the question has been answered multiple times in this thread which I encourage you to read. Short answer, a small cupful is fine. For the brooms, I don't see why you can't just replace them and tell her you bought new ones. She needn't know why. You can always buy a fancy model and tell her you find it simply works better at getting the dust. But yes, you can also soak them in Chinese Wash and perhaps pass them through some Uncrossing incense as well. Finally, for the herbs from the bath, you can compost them. My family seems to be having quite a bit of bad luck, and I'm afraid that it's going to get worse. For some perspective, my sister was in a wreck last week (she's fine, but it totaled the car), and my great aunt fell and may need to get her two front teeth capped/replaced. Is there anything I can do to turn the tide? I would suggest a Van Van kit (http://www.luckymojo.com/vanvan.html)! Family bad energy... Need help. I just wanted to confirm something, I have been doing salt baths, lighting white candles, using sage to cleanse my whole house, and I did the egg cleansing since Saturday.My question was I started bleeding today,(sorry TMI) but Im not due for my period for another two weeks or so, Im on the pill and Ive had bleeding on the pill before but that hasnt happened since middle of last year and now Im bleeding again, I just want to confirm with others and get their opinion, this is a sign to me, that my cleansing is working, cause to me having my period is a way that my body cleans itself. Please help or info would be greatly appreciated, and thank you for your time. There's no Hoodoo advice here. Just PLEASE see a physician immediately. It sounds like a medical problem. I hope this is in the right topic. Anyway, I'm almost 30, I have a son and a husband, but for as long as I can remember I have been low on energy, lazy and a bit unmotivated. I want to be motivated, I want to do things, but I just can't get the energy up to achieve much. I have depression and add and am being treated for both and the lazy is one thing I'm working on with my counselor, but what can I use magically to give myself a boost? I hate being like this and it makes me feel bad and I do as much as I can before I lose my motivation entirely, but I can only push myself so much. It's great to know that you're taking initiative on this! Congrats! I am moving you to a thread with great ideas (and I especially like the Cast off Evil spell kit). Please take a look at the posts there. I was wondering if one can use a powder to clean oneself after a negative work, i.e. after laying a break-up powder how can one clean quickly afterwards instead of washing and waiting to do so? Many thanks! This is the incorrect area for this post. I will split, move, and merge this to the appropriate subforum. PLEASE be mindful where you post as it is a lot of work for the moderators. Dragonfly72, Miss Aida is right in her advice. I just want to throw out there that I have used Florida Water in a pinch to quickly get "yuk" off me until I could do a more proper cleanse ... and it worked great. You could put some in a spritz bottle and it would look like you are using perfume. Or, you could put some on a paper towel and carry it with you in a zip lock baggie to use right after doing the work. I have a spritz bottle with a bit of Chinese Wash, Blessed Salt, Holy Water, and Florida Water in it for emergencies, but like Miss Aida said, you could use condition bath crystals ( jinx killer, uncrossing, etc ) specifically for your situation. Take Care. There are a few choices depending on how you prefer working, but unless the source of the erratic energy is dealt with, you'll probably have to repeat the cleansing on a regular basis. How do you cleanse used furniture of any attached energies good or bad. The last thing I need is to bring something bad into my home, but I'm looking for some unusual pieces that are no longer made and love these items I picked out. What is the best option for cleansing. If it matters, I do not have the option of doing the work before they are brought into the house because some are quite large/heavy and need to be delivered. sunnyone: I usually use incense for this purpose. You can optionally use a black hen feather whisk for directing the incense. Lucky Mojo sells a very fine one that would work for this purpose. I find the incense can really get all around (and into if it is fabric) the used furniture and good that we clean before setting them up in our home. Best of luck! Joseph Magnuson wrote: sunnyone: I usually use incense for this purpose. You can optionally use a black hen feather whisk for directing the incense. Lucky Mojo sells a very fine one that would work for this purpose. I find the incense can really get all around (and into if it is fabric) the used furniture and good that we clean before setting them up in our home. Best of luck! Thank you Joseph Magnuson for your suggestion. Is there a particular incense that you use or prefer to use? How do you feel about using smoke from sage? Greetings to everyone! Please pardon me if the answer to my question is already posted (I didn't see it). I'm very much a beginner, so bear with me. My current living situation finds me "couchsurfing" in someone else's home, and although temporary, unless the spirits can help me sooner than expected I might be like this a while. So if I purchase a spell kit for my condition, I might not be able to clean the whole place with floor wash as I would in my own home. My question: by skipping that step, how much less effective would the spells be? 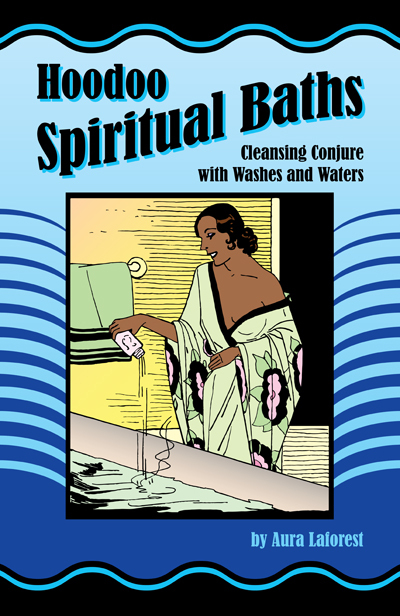 Would a spiritual cleansing bath and perhaps cleansing personal possessions be sufficient? Would your hosts actually object to your washing their floors for them? They don't have to know anything about "clearing away that evil mess," of course. As far as they're concerned, you're being extra super helpful with the housework. Bend Over Spiritual Supplies wrote: My introduction to Bend-Over products came in 1962, when, as a 15-year-old girl, i walked into a candle store in the African-American section of Oakland, California. I was browsing around and saw a bottle of Valmor brand Essence of Bend-Over Floor Wash. The label, with its old-time culturally appropriative image of a white woman wearing a bikini and a turban bowing down to a golden Buddha is pretty amusing, and i started to laugh, because the name was so odd, but i thought better of it and instead asked the proprietor, "Why would someone use a floor wash called Essence of Bend-Over?" His answer opened a new perspective on race relations for me. I was a teenager from a liberal, academic, Jewish-agnostic, socialist family and was primarily familiar with black life through blues music and the civil rights movement. Disregarding my age, the man addressed me with the deference he probably gave to all white women. "Some of the people," he said, emphasizing the word "people" to indicate that he meant his people, "work for other people" (and by this i knew he meant white people), "and they wash the floors." That was it. That was his entire reply. He didn't need to say anything more; i got the picture: If i had to wash people's floors for a living, i might well want them to "bend over" too. Thank you for your interesting reply. I'll consider doing the floors. However, I was under the impression it is necessary to wash EVERYTHING, ceilings and walls included, from front to back, every room and closet, even the attic and basement. Would simply the kitchen and bathroom suffice? Well, looking at your first post, I don't see you naming any particular spell kit. I don't know of many spells that require you to wash every wall, floor and ceiling in your house. The thorough cleaning you describe is rarely done more often than once a year -- preferably at the New Year -- by folks who are accustomed to the work. If your hosts show no sign of being crossed or unlucky, they probably do not need a spiritual cleansing, though you might. Cleanse yourself and the room where you sleep, and then follow the complete directions in whichever spell kit you purchase. I am having problems with suddenly being tired and losing focus and motivation when I am about to cleanse the home. My Lucky Mojo order won't arrive for a bit, but I'm eager to clean. It just so happens that I have the fixings for a Chinese Wash: I bathed in a few drops of authentic lemon verbena essential oil in water of course. I took some of that wash water, put a stick of broom corn in it and I am set to clean my floors back-to-front, top-to-bottom floor with this. This is a makeshift Chinese Wash until mine arrives in the mail. I don't mind cleaning all over again when it comes - I want what was put on my OFF. Have other people experienced feeling suddenly drained and too sleepy to do a spiritual cleansing? I was excited to do it and now I feel too sleepy, like I have to lay down. The same thing happened yesterday. It's 2 p.m.
Could this be some artificial (placed there by spell work) resistance to work that benefits me? Yes, that is not uncommon when something is trying to fight you. Your observations are most likely correct. I say this because it happens to me. Sometimes, I will deal with negative entities and they do the same thing to me when I want to cleanse. BUT I muscle up the strength and do what I got to do (I'm an Aries and I HAVE to win! LOL). I also have some LMCCo love products. Is there some way I could mix the products to use to cleanse everywhere? Some clients will steep the 13 herb bath and then strain it into a spray bottle. Then, they wash with that. They do this until they get their Chinese Wash. I hear that it works very well. You could burn the white sage afterwards. However, you still need the Chinese wash and it brings in good vibrations while washing away the negative ones. Thank you Miss Aida. I will do that while I wait for my order of Chinese Wash. When it arrives I may use it in my carpet cleaning vacuum. Angelkitty, on top of Miss Aida's excellent suggestion you could also sprinkle some of the Healing Sachet and vacuum it up while waiting on your Chinese Wash or make some five point patterns (a dot of oil in each corner of the room with one dot in the center) with the 7-11 Holy Oil or the Blessing Oil. Thank you once again Miss Phoenix. I'll definitely do that also. I have placed an order for Chinese wash, but until then, today I took both Miss Aida and Miss Phoenix's advice. I sprinkled healing sachet powder all over the carpet and let it sit while I prayed and left 13 herb bath steeping for 13 minutes. I then put one drop of blessing oil, one drop of cast off evil oil and a drop of 7-11 oil in with the 13 herb bath in a spray bottle. I vacuumed up the powder and went around my room reading psalm 37 whilst spraying the carpet and all surfaces. I then wiped all of the surfaces down. I took some of the water and oil mixture to the crossroads to dispose of it. I hope this is alright until the Chinese wash arrives. Glad to see you are working to cleanse and clean the home and replace it. Great job!! however next time you do it ( and we should cleanse regularly to keep us clean ) spray first wipe down, then when dry lay the powers. you can leave it on the carpet put a light dusting. You should consider bathing yourself in the 13 herb and then using another bath to replace the negativity you feel with something positive. Like attraction to draw new wonderful things in. Thank you for your help and advice j82. I'll take a look at LM baths and see what I could use after 13 herb baths, would my LM attraction oil be alright to start with? I will do 13 herb baths next week when I know I'll definitely be up early enough to do them. Yes there are many ways to cleanse or replace after a bath, such as burning a candle in a room, lighting proper incense, or taking a bath. Also start wearing a mojo after doing work is another way to work it! I don't know if this has been mentioned on here before. I'm planning on painting the inside of my home by Christmas. Also, my home needs to be spiritually cleansed. I currently have LM Chinese Wash, LM FWP Incense and LM FWP Oil. My question is, should I cleanse my home before or after I paint? Thank you! Since you need clean walls to paint on, i would clean with Chinese Wash before painting. Then, depending on whether you are using water-based or oil-based paints, mix in a little of some positive and protective bath-crystals dissolved in water into water-based latex paint or some oils of the same type into oil-based paint. Test the mixing qualities first. If mixing is not practicable, smoke the premises with incense after painting. I've recently moved and have a very annoying neighbor (they get very boisterous between the hours of 2 and 4 am EVERY night/morning) and while I was considering what to do about them, it made me think about the neighbors that have been so welcoming and wonderful. I lost my home after 15 years and my neighbors there were like a second family so having the friendly, outgoing neighbors is so important and helpful to my sense of home and security. There is one particular, elderly couple who are just so beautiful and warm. I was worried about how my 13 year old skateboarding, basketball-bouncing son would be received but they are always saying how adorable he is and asking if we need anything. She baked us brownies! Of course I have thought of blessing powders, lighting a candle and including them in my prayers as well as reciprocating and being a good neighbor. Just wondering if anyone had any other ideas? That's so sweet! You are so nice! I am merging your post over to the blessing thread where there are many spell ideas for you. Sorry about that, Miss Aida! I know you do so much work on the board and I hate to be the one to cause more. Thank you for being patient with me! Welcome to the new Neighborhood! Cooking a nice dish prepared in a way to offer health and wealth to the neighbors is a great way! the LM books on cooking is available for that ! A blessing candle is a nice candle for them. Peaceful water from LM would be a great think to wash down stoops and sidewalks. A honey jar with "New neighbor"s would help as well. Since you in a new place I would also wash it down with Chinese floor wash then use happy home LM products wash and incense to cleanse the home. that should make a happy home! . Also logical options.. cut the grass regularly, smile, wave high, shovel your snow and theirs ( if it applies).. normal courteousness will win their hearts! I did do my cleaning, cleansing, dressing and blessing routine when I moved in and wanted to do something extra for my neighbors without scaring them, if you know what I mean... I like the idea of washing their stoop with LM products (I have the Peace water and Chinese wash) and a honey jar for them. I don't know why I never go with the simple (and in many cases, most effective) things first! I also like the cookbook suggestion. Hmmm, I wonder if she put anything in my brownies LOL! Hello. First I want to apologize in advance for my question, as I am new and still learning very basic things... please bear with me. Some time back, my sister in law told me she had been severely bothered by spirits and she wanted them to stop. She sought the advice of an adviser of hers, who told her to make rose water and cleanse herself in it as well as smudging her house using white sage. She was told specific directions on making the rose water... she was told to use not only the rose heads but also the stems and leaves (basically the whole rose bush) .... and to simmer the entire lot in a large pot and then strain it and use... and any leftovers after the cleansing she should add to her shampoo bottle. My question is this... I have never, ever heard of using the stems and leaves... has anyone else? Is this common and do you recommend it? I respectfully thank you all in advance. I have not, but I grew up in NY with a large dominican population and rose water was readily available at any store. But your sister should advise the person who told her. this is a site for LM products, LM does sell a rose water. That being said, this workers advise may be correct based on the teaching and methodology that he/she follows. Without having much info, its hard to tell if you are talking hoodoo or something else like Santeria or voodoo. I am not sure why the worker said add all those items but they may have a reason and me telling you yes or no does not include what that persons reason was. Were the thorns for protection against a spirit? she may as well try it, but you can always order a LM fiery wall or cast of evil kit for her if that dont work. Unfortunately, we don't address Santeria or other magical practices on this forum. Just Hoodoo and Lucky Mojo products. As J82 mentioned, you would need to ask that person. And, you really need to ask ANY spell caster:" What is this"? "Why am I using this" "How does this help"? Thank you very much I appreciate this. I am VERY new to all of this and I most certainly do not want to get in over my head... or get into something dangerous. My sister in law practices Native American beliefs and I thought it seemed strange somehow. Not that I am an authority by any stretch of the imagination. I am really enjoying learning and reading here on the forum and especially appreciate the respectfullness and kindness. Thank you. I was hoping to get some opinions on this situation. I am a single female and had a house guest (married man) stay in my guest room for 3 days. I had no romantic inclinations towards this person but after a day he did. I successfully deflected his subtle advances and he has left my house on good terms. But after he left, I avoided the guest room for a few days. I couldn't stand being in there for longer than a minute and only if absolutely necessary. Any idea as to why? Is it just because the idea of a married man coming on to me bothered me? It could just be that the situation was uncomfortable, it could also be the ''residue'' leftover from the man's intentions and person. If you have sage, pine resin, Van Van incense or Uncrossing incense, it's definitely worth smoking the room and then washing it out with some Chinese Wash. Thank you Aura! I do have sage and will get Chinese wash to follow your advice!